I was in Vegas last weekend and treated myself to vegan sorbet at The Venetian. (See my previous Vegas post, A Vegan Taste of Vegas). I posted a picture of the variety on Facebook and dozens of Herbies left comments asking how they could make sorbet themselves at home and where they might find vegan sorbet. Here's the good news: sorbets are nearly always vegan (dairy-free).I've actually neverfound a sorbet that wasn't vegan, but I'm still timid to say, "sorbet is always vegan!" — because you never know. If you have an ice cream parlor, gelateria, etc. 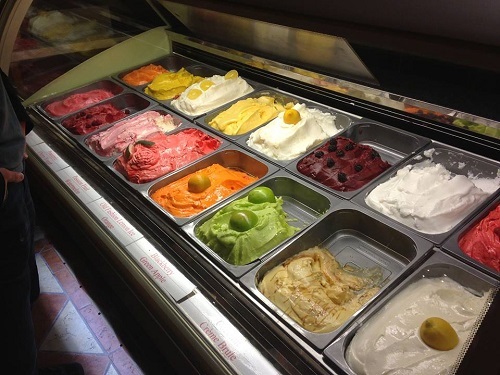 in your town, they probably sell at least one flavor of sorbet, so check it out. (Always ask!). I find "lemon" is the most popular and it's my favorite :) Commercial sorbet sold at the store, such as Häagen-Dazs is also usually vegan. (Again, never found a brand or flavor that wasn't, but you never know — always look). If you're unfamiliar with sorbet, it's a Middle Eastern dessert made of fresh fruit juice (or fruit) and water. It's the fruity cousin to ice cream, albeit a little denser since unlike ice cream, air is not whipped into sorbet. I also find sorbet has a more concentrated taste. For example, when you eat mango sorbet, it really tastes like fresh mango, compared to mango ice cream that just has a subtle hint of mango flavor. Of course, most commercially sold sorbets are sweetened with sugar so if you want something super healthy, do it yourself. Thankfully, making sorbet is really easy.If you have an ice cream machine (I got mine on sale for $30) — great, but you don't need one. A blender works just fine! One of my favorite easy sorbets is frozen peaches + vanilla almond milk (or water if you want it less creamy and more "legit"). Put the peaches in your blender and add small amounts of almond milk (or water), as necessary, until you get a smooth, thick, sorbet. For those with food processors, you can use a food processor, but I find it whips a lot of air in, so it's more like a not-so-creamy ice cream, but it still tastes delicious. Note: If you use bananas, you get a creamy ice cream (see HH banana ice cream), which isn't a bad thing, but it's not "sorbet" style (if you know what I mean). If you have an ice cream maker, dig out the manual and see what it says about sorbet. Usually the recipe is something like liquid + sugar + frozen fruit for 30 minutes to an hour. Actually, I find most recipes for sorbets call for sugar and sweeteners, which I find are unnecessary (and dare I say, too much) when you're using frozen fruits. Fresh fruits sometimes need a little help, but frozen fruits are picked at their ripest (then frozen), so I find they are plenty sweet. I also find adding a little fresh lemon juice (say 1-2 tbsp) really gives sorbet a little something extra. Lemon juice also helps keep the fruit from turning brown. A friend of mine also swears you must add 1-2 tbsp of vodka, but I haven't tried that yet. If your sorbet gets too melty during the making process, place it in a glass dish and freeze for 15-30 minutes, or thereabouts. If you want to make ice cream, try the banana ice cream (link above) or tofu ice cream (despite the name it's actually pretty incredible).